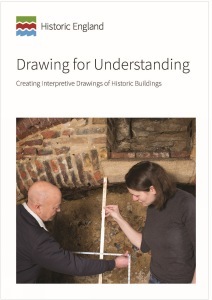 This guidance describes a method of recording historic buildings for the purpose of historical understanding using analytical site drawing and measuring by hand. The techniques described here have a long tradition of being used to aid understanding by observation and close contact with building fabric. They can be used by all involved in making records of buildings of all types and ages, but are particularly useful for vernacular buildings and architectural details which are crucial to the history of a building or site. .
Record drawings are best used alongside other recording techniques such as written reports and photography or to supplement digital survey data. They can also be used as a basis for illustrations that disseminate understanding to wider audiences.